We’re back with our weekly Manic Presents Redscroll Blog! 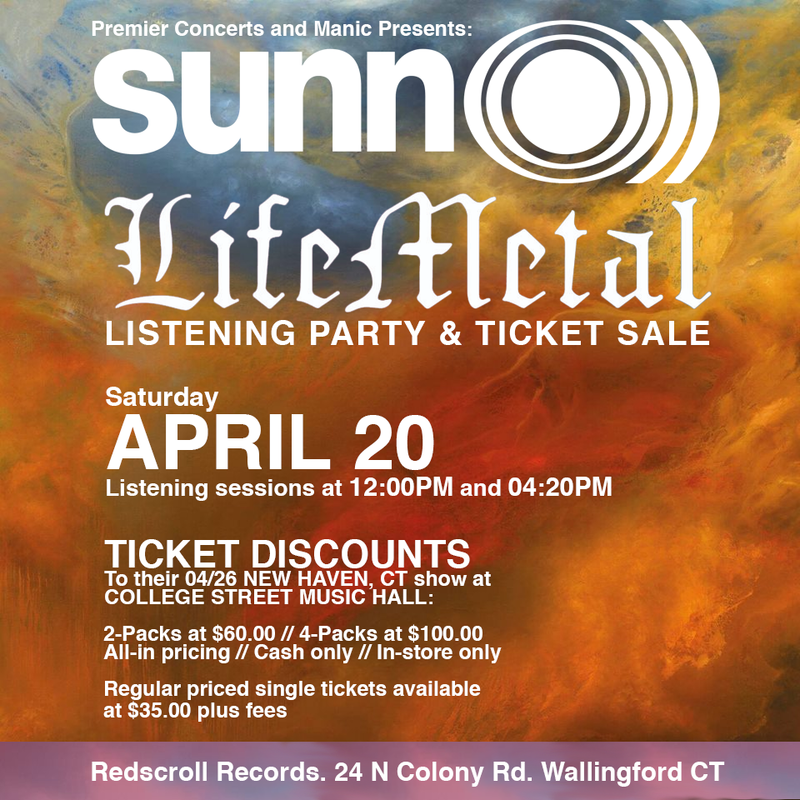 This week will be a little longer as Redscroll Records gets ready for their 12th Anniversary Sale and Record Store Day next weekend!! So here’s all the exciting announcements from this week and the next two week’s list of show! Just announced at College Street Music Hall – Little Steven and the Disciples of Soul featuring Steven Van Zandt – founding member of Bruce Springsteen and The E Street Band (7/16)! At Space Ballroom – iconic ska bands Mephiskapheles and Pilfers co-headline on (5/24) and D.C. punk rockers Ex Hex on (8/20)! At Wall Street Theater in Norwalk – The Allman Betts Band featuring the sons of Gregg Allman and Dickey Betts (7/07)! Lastly, at Cafe Nine – Denver doom-metal bad Dreadnought (7/01) will perform as part of our weekly Manic Mondays series! Don’t forget to grab your tickets and RSVP today! This week’s show schedule begins TONIGHT (4/04) with Nostalgia Personified w/ Nickelodeon’s Pete & Pete live podcast at Space Ballroom! The jam-packed weekend continues Friday (4/05) with Oklahoma garage rock band BRONCHO performing at Space Ballroom! On Saturday (4/06) we have Nashville-based singer-songwriter Old Sea Brigade at Space Ballroom (Front Room) and the SOLD OUT Cody Ko & Noel Miller: Tiny Meat Gang Live at College Street Music Hall! We continue on Sunday (4/07) with Northampton indie rockers And the Kids at Space Ballroom (Front Room)! On Monday (4/8) we have Canadian grindcore band WAKE at Cafe Nine as part of our weekly Manic Mondays series! On Tuesday (4/09) we have best selling author and poet Neil Hilborn and on Wednesday (4/10) we have Portland, ME singer-songwriter Lady Lamb performing at Space Ballroom! Next week begins on Thursday (4/11) at Wall Street Theater in Norwalk with legendary experimental guitarist Adrian Belew! The fun continues next week on Friday (4/12) at College Street Music Hall with iconic jam band Twiddle and NYC psych-pop trio Yeasayer at Space Ballroom! Saturday (4/13) features The Claypool Lennon Delirium at College Street Music Hall and Dancehall pop sibling duo Wild Belle at Space Ballroom! Brooklyn psych-rock band Habibi headlines Manic Monday at Cafe Nine on Monday (4/15)! Tuesday (4/16) ends the weeks with Less Than Jake at College Street Music Hall. Be sure to grab your tickets and RSVP! CONTEST TIME! 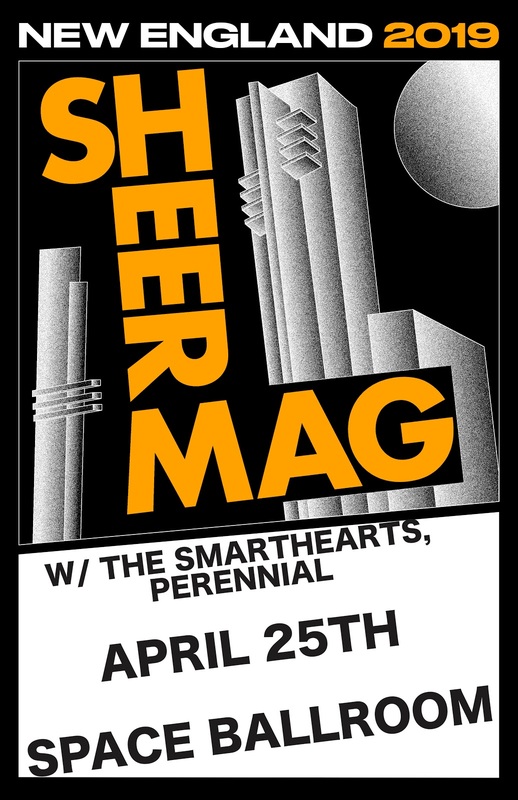 Enter for a chance to win a pair of tickets to Sheer Mag at Space Ballroom on (4/25) and a copy of their latest album on vinyl and t shirt! Keep an eye out for more announcements and we’ll see you back here next Thursday! We’re back with our weekly Manic Presents Redscroll Blog! As usual, we’re here to share some exciting show announcements and remind you of the great shows happening this week. Just announced at Space Ballroom we have Ghost Light feat. Holly Bowling, Tom Hamilton (JRAD), Raina Mullen, Scotty Zwang, Dan Africano on (5/9) and Frank Iero and The Future Violents on (5/31)! Tickets for both shows will be on sale tomorrow at 10AM! This week’s show schedule begins TOMORROW (3/22) with Brazil’s biggest YouTuber Whindersson Nunes at College Street Music Hall! The jam-packed weekend continues Saturday (3/23) with a special full chamber orchestra performance by José González & The String Theory at College Street Music Hall; a SOLD OUT show with Into Another at Space Ballroom ; and The Music of Cream celebrating the 50th anniversary of Cream at Wall Street Theater! Our weekly Manic Mondays series at Cafe Nine this week features shoegaze/punk band Elizabeth Color Wheel on (3/25). Finally, on Wednesday (3/27), Brooklyn experimental duo Buke and Gase perform at Space Ballroom (Front Room). Don’t forget to grab your tickets and RSVP today! CONTEST TIME! 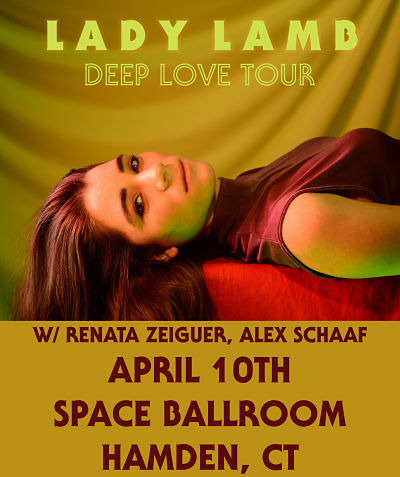 Enter for a chance to win a pair of tickets to Lady Lamb at Space Ballroom on (4/10) and a CD copy of “After”! We’re back with our weekly Manic Presents Redscroll Blog! As usual, we’re here to share some exciting show announcements and remind you of the great shows happening this week. 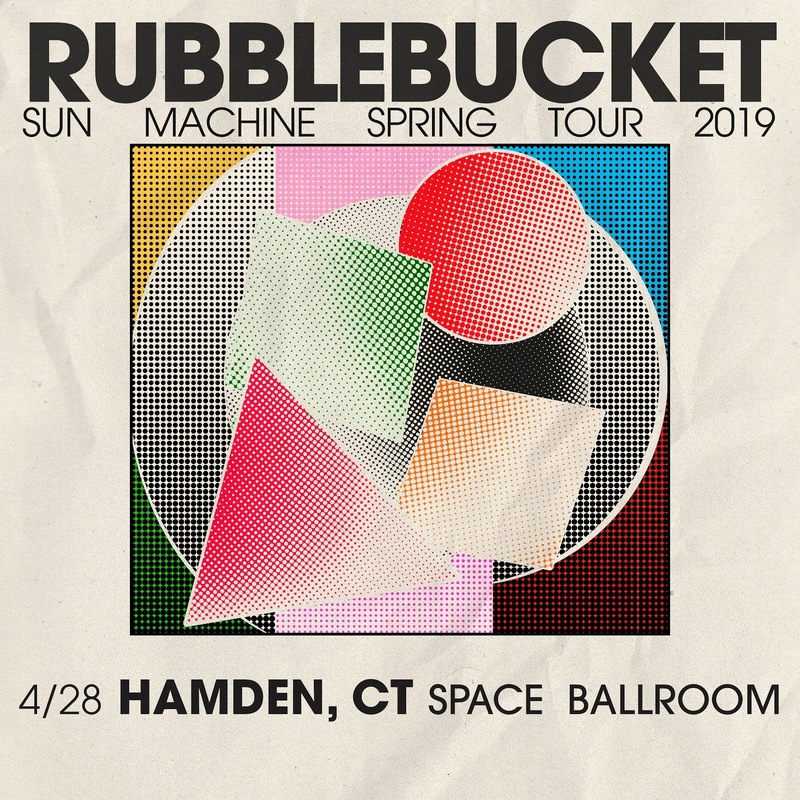 Just announced at College Street Music Hall – THE Trey Anastasio Band on (4/27) and Built to Spill play Keep It Like A Secret in its entirety on (9/28). At Space Ballroom – Courage My Love and Potty Mouth co-headline on (5/2); Husband-wife soul/roots duo The War and Treaty on (7/3); and Detroit indie rocker Stef Chura on (7/10). Tickets for all shows will be available 10AM Friday, March 15th! This week’s show schedule begins TONIGHT (3/14) with a SOLD OUT Joe Russo’s Almost Dead show at College Street Music Hall! The jam-packed weekend continues Friday (3/15) with Grammy Award winning folk band Punch Brothers at College Street Music Hall and Chadwick Stokes and The Pintos at the Space Ballroom! On Saturday (3/16), The Marshall Tucker Band plays Wall Street Theater and great seats are going fast! Our weekly Manic Mondays series at Cafe Nine features SoCal punk band Plague Vendor on (3/18). Finally, on Tuesday (3/19), Gogol Bordello returns to College Street Music Hall for their 20th Anniversary Tour. Tickets are going fast so grab yours today! CONTEST TIME! 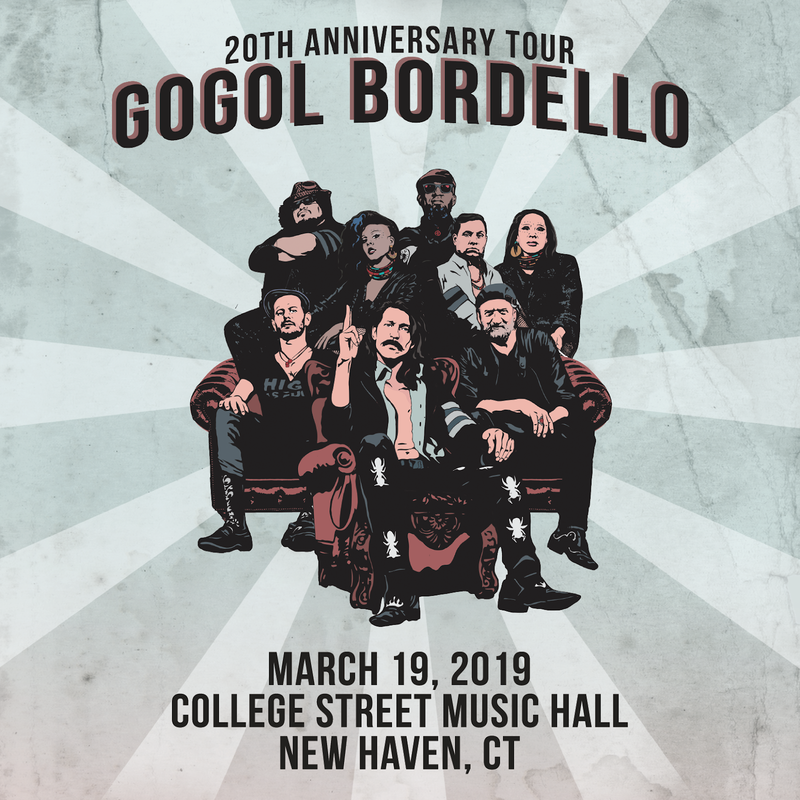 Enter for a chance to win a pair of tickets and M&G with Gogol Bordello at College Street Music Hall on (3/19)!